Atlanta’s Dr. Sivananda Nyayapathi won the 4th place award of the Portrait Society of America’s 2014 Members Only Annual Competition, among over 800 talented art works submitted from around the world. Criteria included not only the artists’ technical skills but also imagination, emotion, and ability to communicate their idea. He will be recognized in the Portrait Society’s The Art of the Portrait Journal. Siva, as he is also known, began with pencil and water colors, learning from his father who was a painter, writer, dramatist, and singer—and from age 12, Siva was winning awards. During his studies at IIT Kharagpur he worked with oils and represented IIT in competitions, as well as painting huge backdrops for stage productions. Siva moved to Atlanta in 1996, studied the techniques of the old masters, and learned portraiture from various International Masters. Cycle of life - Oil on panel, 8" x 10" -- 4th place award in the Portrait Society of America members only competition, 2014. Finalist in Oil Painters of America Eastern Region Juried Competition, 2014. Finalist in Salon International Juried Competition, 2014. 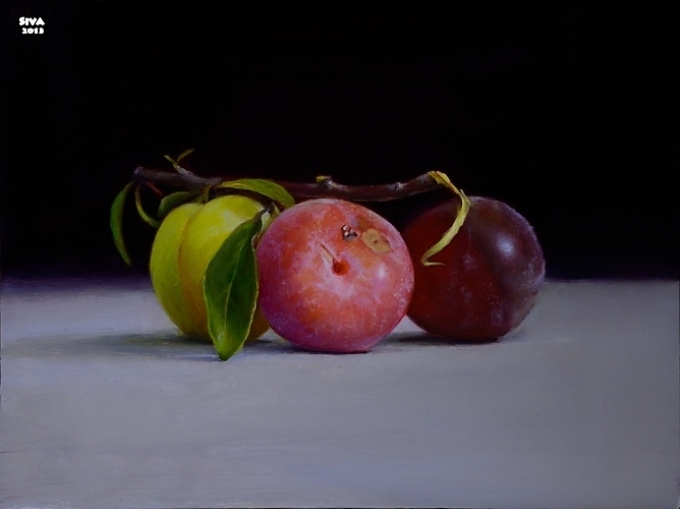 He is a juried member and former board member of the Portrait Society of Atlanta (PSA), a signature member of the Atlanta Fine Arts League, and an associate member of the Oil Painters of America. He is one of the Art Renewal Center’s selected “Living Artists,” has won many awards, and was juried to be included in the International Contemporary Masters Vol. V for 2011. Scientific research demonstrates that fundamental principles are simple and universal. Siva teaches that the same holds for art; the trick is to know how to break down the complexity into these simple basic elements. His realistic paintings are simply beautiful. 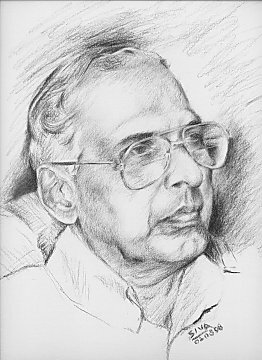 (Left) Prof. P. V. Rao - Charcoal on paper, 12" x 16"